a free black man who was abducted and sold into slavery in 1841. Speaking to actor/screenwriter Kelsey Scott was a delightful, amusing, insightful experience. Kelsey, who plays Solomon Northup's wife Anne in Steve McQueen's harrowing upcoming drama 12 Years a Slave, candidly and graciously spoke on the personal difficulties surrounding her trip - which almost didn't happen - to that fateful New Orleans audition 2 years ago. The actress/screenwriter began her career on TV back in 1989, when she starred in the ABC sitcom The Robert Guillaume Show. 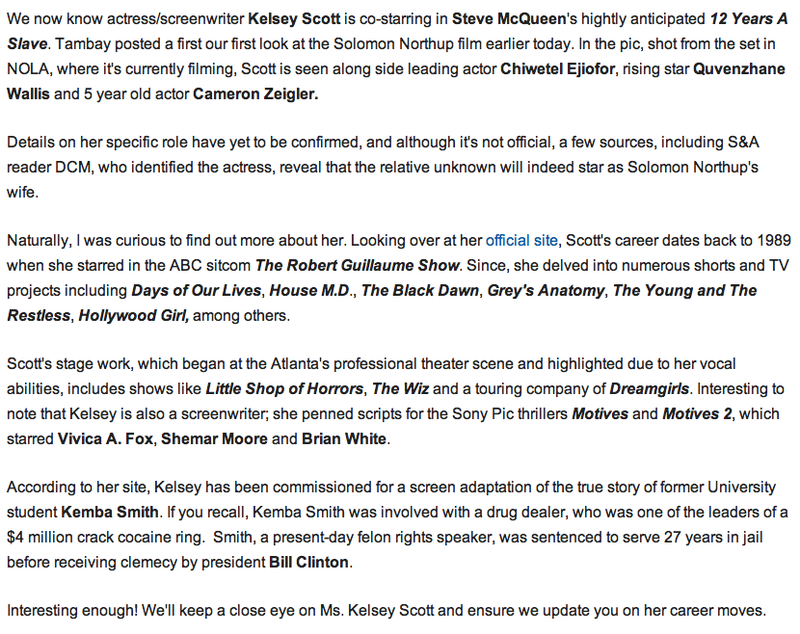 Since then, aside from stage work which began at the Atlanta's professional theater scene, Scott delved into numerous shorts and TV projects including Days of Our Lives, House M.D., The Black Dawn, Grey's Anatomy, The Young and The Restless, Hollywood Girl (web series), among others. However, aside from acting, which she will continue to pursue (especially on film), Scott is an established screenwriter who has penned scripts for the Sony Pic thrillers Motives and Motives 2, the web series Hollywood Girl, along with several short films. Scott, who is also currently working on finishing her script, a feature romantic comedy of her very own, shared a story about the process of embodying the role of Anne - and preparing for that character - that was particularly moving to this interviewer; I'm hopeful that you will find it touching too, as well as inspiring. 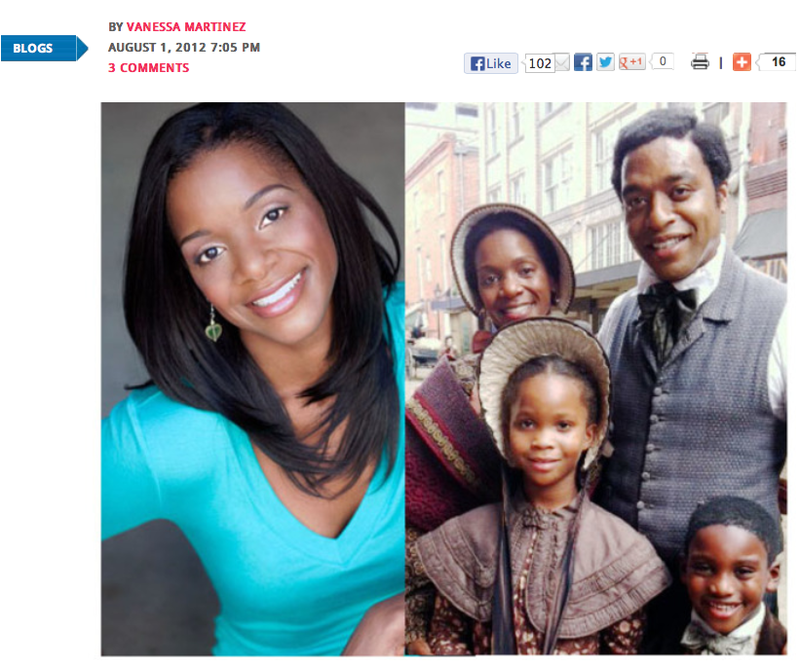 In our interview below, she also elaborates on working with lauded British director Steve McQueen, his "not-so-Hollywood approach" to casting and directing, and actor Chiwetel Ejiofor, who stars as husband in captivity Solomon Northup. VM: How did you get cast in the film? KS: Well, I originally put myself on tape for another role, a smaller role, and I got a call back. I actually had to fly back to New Orleans, and went to the audition. I thought I blew it. I was driving away and I was upset with myself, and so I went to a little restaurant to get myself something to eat and to calm myself, and my agent called and said “go back” and I was like “what do you mean go back?” and he said “they want you to read for a larger role.” Really? That audition that I just thought I blew? Oh ok. I had changed out of my clothes and everything, and I went back and ultimately I was cast as Anne. VM: How was meeting Steve McQueen? Were you familiar with his work? KS: I was very aware of him. I’ve seen Hunger; I’ve seen Shame. I’m a fan of his work and before even putting myself through the original audition, I re-watched his movies to get an idea of his style and to make sure that I was in line with his signature in terms of film. I was nervous going in. I respect his work and I respect him as a filmmaker, so I wanted to put my best foot forward. But he was so nice, really calm and chill and not Hollywood at all, so any nerves that I had dissipated when I actually met him. It was a very nerveless audition. VM: How was he on set as a director? KS: I have like, an actor/director crush on Steve McQueen’s work. What’s really great about him is that he trusts you to do your work before you get to set. I’ve worked with some really great people and everyone has a different style, and Steve is just very much like “I got you, that means I believe in you.” Then you just come to work and you work. If there’s an adjustment to make, then certainly he’s going to step in, but there’s not any kind of micromanaging at all. He just says, “you’re the actor, ok, so I trust you to act. There was one scene specifically where there was no dialogue, and it was between Chiwetel and I. There was an emotion the script said that we needed to convey, and so Steve walks in and he says, “do you guys need me for this or can you figure it out?” [laughs] Sure we can! He clears the room; he goes off set. Chiwetel and I discuss it, figure out what feels organic, what feels right, a couple minutes later, he comes in the room and he says “show me what you got;” we show him and he goes “great let’s film it.” [laughs] That’s amazing, and it felt so empowering to be truly trusted as an artist. VM: How faithful was your character to the book? KS: In general, the book is very true to the memoir. When I read it, it was particularly visceral, and, in the script, it kept that kind of tension, that power. I wondered when I read the book how is he [McQueen] going to adapt this! It’s not mainstream; it’s something for people who want the real story and not kind of the sugar coated or glazed version of it. When I read the screenplay it was so true to it, and then I wondered oh man, how are they going to shoot this! You see her through the eyes of Solomon and he was absolutely in love with his wife; their relationship was one of the things that kept him going through that ordeal and I think that the film is true that also. VM: They must have held many auditions for the part; you were likely selected from several hundred perhaps. Congratulations! KS: Thank you! Well, I don’t know. There was this one time while we were on our lunch break while filming, and Steve [McQueen] just casually asks, “So what other work have you done?” What I realized was that when I went into the audition and the casting director handed him my headshot, he [McQueen] never flipped it over to see whether or not I had however many acting credits, or who else I had worked with, and I doubt he checked my star meter rating on imdb. In that conversation, I realized he strictly cast me off that audition and that’s so not Hollywood. It’s not often that we get those types of chances. Normally when you’re in an L.A. conversation it’s not like that. It’s not only who you know, but your star meter, the number of followers you have on twitter and whether or not you’re somebody’s cousin. So many elements play into getting in the room and getting cast that you just never know. VM: How was working with Chiwetel Ejiofor? KS: By the time our scenes came along, he had done a lot of the shooting on the plantation work while in captivity. There were times where you could feel it on him, not like he wasn’t giving his all performance wise. I just kind of felt that weight of the story sometimes, which is actually very helpful because their relationship was so secure and such a rock for him. Their marriage was important to him and his family was important to him. So on screen, that weight encouraged me to be more of that vessel for him and that solace for him. But off screen he was great! It’s funny because you hear stories that the director chooses the first day to shoot the intimate scenes, which was the same thing that happened. So first we shot a family scene, then next thing you know we’re in the bedroom and I’m like “Hi, I’m Kelsey!” [Laughs] Nice to meet you! VM: Well…that couldn’t be too terrible with Chiwetel. KS: I wasn’t going to complain [laughs]. No, he’s professional, kind and very giving, All around, this cast and crew I came in contact with, it was a very pleasant experience, which doesn’t always happen. In film, TV stage there’s behind the scenes stuff, but my experience was very positive, very nurturing and I appreciated that. VM: How do you prepare for a role like this? Even though you are only in a few scenes, they seem to have required a lot from you emotionally. KS: Part of it was reading the book more than once and trying to get a feel of who this woman [Anne Northup] was. Also understanding Solomon help me me understand Anne. I’m not a mother, but I have a niece and I’m like everyone’s favorite God mom [laughs], but I tried having to equate having a family structure and then having it torn apart. We can always pick things from our past and our lives that have put us in emotional places. Well, [chuckles] I guess I’ll tell the story. A couple of years ago, it seems like yesterday which I’m sure a lot of people can understand, my mother passed away. She was… [sigh] some people would like to have really strong and close relationships with their mothers, and my mother continued to be my best friend even though she’s not physically here. I took a risk in going out for this part, getting to New Orleans almost didn’t happen. I almost didn’t get on that plane to go for that part. Remember, when I went for the call back, I was going for a smaller role, one scene, and I couldn’t afford it. I didn’t have anywhere or knew anyone that I could stay with in New Orleans. It was a risk to do it. But also, on the heels of my mother’s death, I just couldn’t justify myself not going for it. It’s something I’d been doing since I was a child, a success she had always wanted for me, and I said “Ok mom, here we go,” and got on the plane and did it. So in regards to that, there are places we can all go, so we did it together. VM: I’m sorry about your mother. KS: Thank you. Well, I guess this isn’t part of talking about the film [laughs]. VM: No it is, because you’re speaking on what you drew from to play such an emotional role, and these experiences make you a better actor, aside from your creativity and intuition as an artist. Thanks for being so candid. KS: There was a blanket my mom made. It was something she gave me before she passed, and I brought it with me on the trip and I kept it in my trailer, and it was there, so she was there. Particularly when we got to the more difficult scenes it was something that I connected with because as anyone who has gone through the grieving process knows, the stages, you go from bawling your eyes out every single minute to locking everything up and not admitting that you have any emotion. So I went though all of that. There were some scenes that it was necessary for me to be very raw with my feelings, with what was going on, and dealing with grief sometimes makes you go the opposite direction. So that blanket was my connection to my mom to allow me to open up some stuff that I had closed off. In any role you find those things that help you go to those places. VM: I’m touched by your story. I already know that when I see you in this film, I’m going to cry! 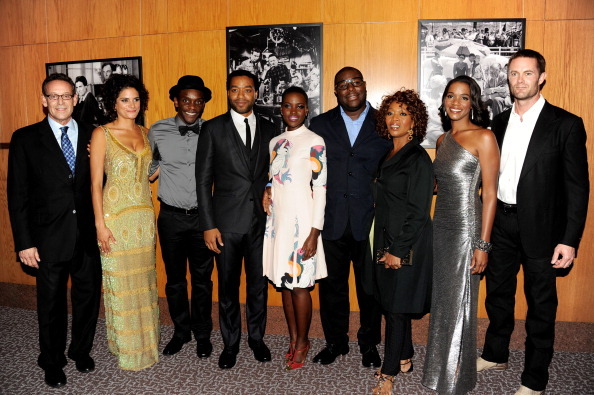 VM: Do you think the brutality and realism of the film will alienate audiences, especially the black audience? KS: I hope people see it. It’s a true story, about our stories. Besides that, I’ve seen it and…it is special. I’m so grateful and humbled to be in it, and feel part of something historic. If I wasn’t in it, I would still go see it, but don’t print that because no one would believe it!